Divers swim around the shipwreck Spiegel Grove in the Florida Keys National Marine Sanctuary. If it wasn't for bad weather, poorly designed watercraft or well executed naval attacks, what would marine archaeologists do? This past year has brought to us a wealth of shipwreck discoveries and allowed our modern era better insight into the ships of the past. If you don't believe Davey Jones still has some fascinating discoveries held captive below the high seas, avoid walking the plank and just check out these videos. 13th Century Mongol ship discovered - They were the peak of land warfare in their time, and perhaps the crew of a sunken Mongol ship regrets leaving the firm ground of Asia behind for the Japanese islands. In a truly rare find, marine archaeologists in Japan uncovered the remains of a ship from a Mongol invasion fleet dating back to 1281. 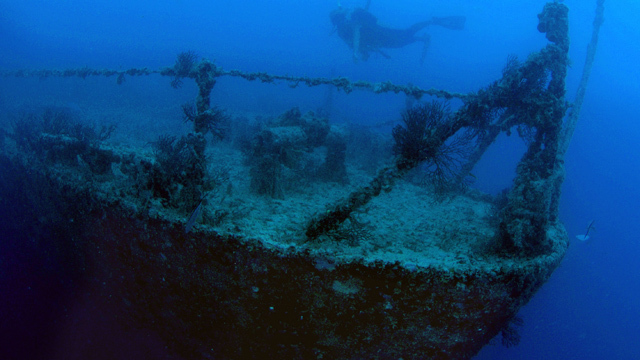 The team believes wreckage could provide better insight into attacks on Japan around that time period. Explorers find shipwreck worth millions - Underwater archaeology and salvage experts, Odyssey Marine Exploration, discovered a sunken British steamship holding millions of dollars in silver bullion. The ship was sunk by a German U-Boat during World War II. But fear not, treasure lovers! The U.S.-based company is working diligently to recover all that silver found 4,700 meters deep. Archaeologists find mystery shipwreck - Sometimes even when you have all the pieces, it's still difficult to solve the puzzle. That's what archaeologists working off the coast of Florida have come to learn. Artifacts from one mystery shipwreck are about 200 years old, but the teams aren't sure which side of the Revolutionary War this ship supported. Don't be sucked into this one. The company that promotes this is a penny stock firm. They have been doing this for 20yrs! Their first deal was Seahawk...the Atocha...and the pr caused the stock to soar. Bottom line they never really get much out of it to benefit the shareholders. Sometimes a cool story is just that. "Old news"? I'd like to have a 100 foot old news. I'm sure the advanced technology has enhanced the finding of sunken objects and I'm sure it pays off for those who can afford it and are willing to take the inherent risks. We all benefit from the finds. if it sounds to good to be true...then it is. Sorry, not going to watch stupid commercials to see ship wrecks.